It’s been a while and a frustrating month since my eye surgery. Unfortunately things didn’t go quite to plan and I have continuing problems focusing, and getting back to normal will take a while longer than anticipated. 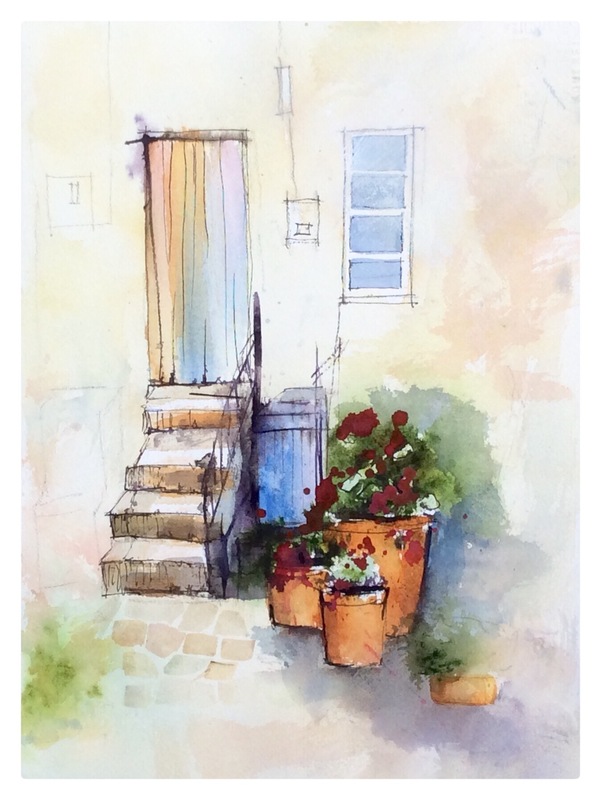 But that didn’t stop me taking a workshop with John Lovett, an artist I’ve long admired and was fortunate to be able to get into his class. I figured I’d be able to soak up some knowledge even if I couldn’t focus too well. I did however manage but suffered a bit with eye strain at the end of each day. I did learn a lot and will do some more to some of these paintings at a later date but I thought I’d share them as they were at the end of each workshop. Our first lesson was an exercise in simplification of a fairly busy village scene. John uses mixed media, generally starting with a very loose charcoal pencil sketch. This is followed by washes with his signature rough brush, various sized flat brushes for windows and brickwork, dip pen and ink for linework. Sometimes a rigger brush is used, sometimes an Inktense pencil. He sometimes uses gesso throughout his work, to soften areas and draws back into them. 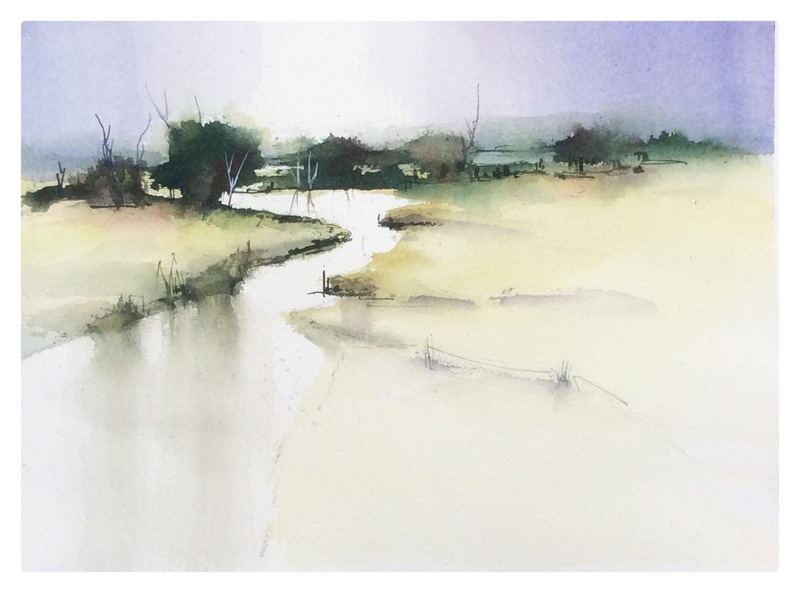 Then a river landscape which was a composition exercise in creating a focal point. I would have liked to carry this one a bit further but my eyes were telling me no. Next lesson was once again choosing a focal point and different textures, drawing first with a charcoal pencil, applying loose washes over, then picking out details with ink and dip pen. The final session was another river landscape with a rock escarpment. This was a fun exercise as rocks are very forgiving. 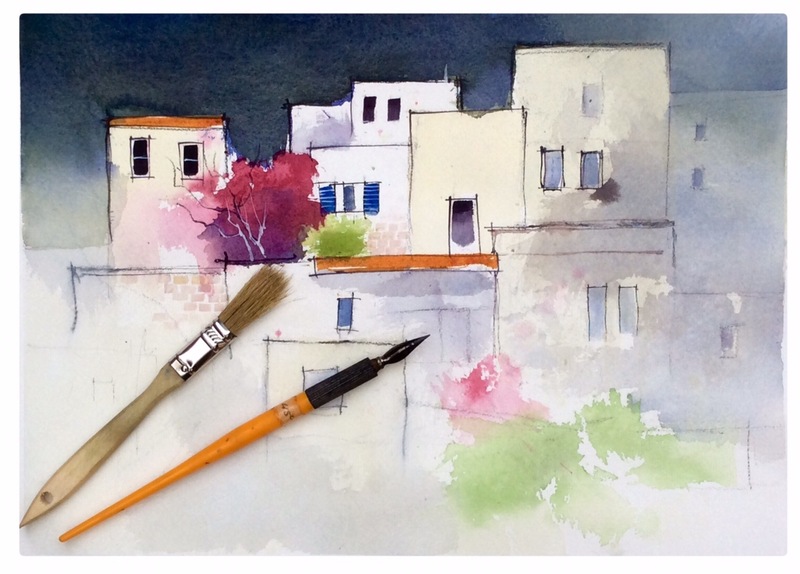 Dropping colour into wet areas, as well as drawing with ink into damp areas gives unpredictable results. 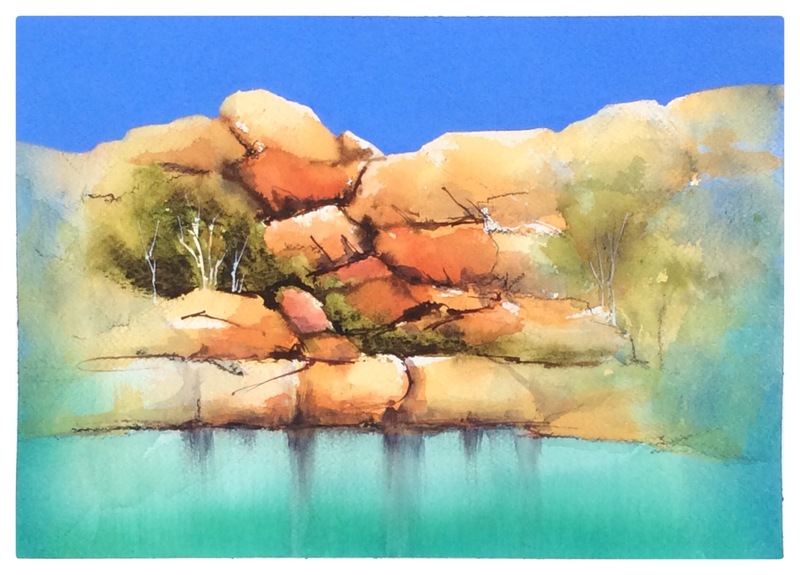 Gouache was used for some tree trunks and that vivid blue sky, so typical of northern Australian landscapes. John teaches in Australia, Europe and US each year. If you have the opportunity to take one of his workshops you won’t be disappointed. Failing that there is a wealth of information, very generously shared on his website and he has books, dvd’s and downloadable lessons available there.